If you’re looking for a fast and simple way to add beauty and appeal to your home or business, mulch is it. Beyond its aesthetic benefits, mulch helps to discourage weed germination. During the summer, mulch can help keep your soil moist, which is critical during long, dry stretches of hot temperatures. In the winter, mulch can help protect plant roots from the dangers associated with frost. Best of all, mulch requires little to no maintenance and comes in a variety of colors. There are several other key advantages of using mulch in your landscaping. When you allow our mulching crew to apply mulch at your home or business, you can rest easy knowing that we are improving the appearance and health of your lawn. Depending on the type used, mulch can add substantial nutrients to the soil, which is essential for maintaining a healthy, green lawn. Mulch can also be beneficial in controlling insects and disease and keeping hedges and plants in proper shape. Mulching begins early in the year before spring annuals are planted and perennials emerge. In most flower beds, a 3-inch thick layer of mulch is optimal for both appearance and plant health. In landscaping beds with shrubs and dense flowers, a slightly lighter layer of mulch is sufficient. Thick layers of mulch can also be added around trees, bushes, and other areas of your landscaping adding to the appearance of your home or business and to help maintain a more consistent soil temperature year-round. Our lawn care services aim to suit your individual tastes, needs, and budget. Allow our team to design a custom landscape design featuring thick, visual appealing mulch in key locations to enhance the overall layout of your property. Mulch is also beneficial for covering bare patches in your yard, or simply adding color to a boring landscape. When it comes to mulching in our residential and commercial clients have plenty of options to choose from. Depending on the desired function, we offer a full range of mulch options. 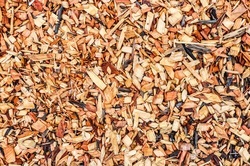 Some of these options include pebble mulch, gravel, rock mulch, straw mulch, pumice rock mulch, grass clippings, landscape fabric, newspaper or cardboard, wood chips, pine straw, sawdust, and shredded bark. Each type of mulch has its share of benefits and can be used in various parts of the yard to achieve aesthetical and functional value. For more information about our Knoxville Landscaping Company mulching services, contact us today. Knoxville Landscaping company will keep your lawn at its best by providing the unique services your lawn needs to thrive. Our skilled lawn care specialists have the ability and knowledge to keep your lawn healthy and looking great throughout the entirety of the year. For the best in Knoxville, contact Knoxville Landscaping Company. If you’re in need of shrub and bush maintenance, then Knoxville Landscaping Company is the company you are looking for. We provide pruning and trimming services for shrubs and bushes. These types of plants can range in size and density, making it difficult to achieve an optimal design on your own. Let our crew provide professional shrub and bush maintenance to keep your landscape looking its very best. Natural shrub and bush pruning promotes dense foliage and healthy growth. Pruning keeps your plants strong and sturdy It also keeps your yard tidy and hazard free and is appealing to the eye. In addition to trimming and pruning, treatments will keep your landscape in optimal health. Our shrub and bush maintenance includes soil treatments, fertilizers, and spray applications to keep insects and disease at bay, which is essential for the long-term health of your shrubs and bushes. Call us for our shrub and bush treatments to keep your plants healthy and vibrant. Your shrubs and bushes should ideally be trimmed or pruned when they begin to grow out and look untidy. To maintain the look of your landscaping year-round, have a lawn care specialist provide the necessary services for your shrubs and bushes during late spring and late summer. Flower shrubs are the exception, as they require prompt pruning shortly after blooming. We use various techniques to achieve professional looking shrubs and bushes. Many of our residential and commercial clients choose to simply thin their shrubs, which involves selectively removing branches at the base to open up the crown. This helps to emphasize the larger stems, while maximizing light penetration. For more information about our shrub and bush maintenance services, or to schedule a visit from our team of lawn care professionals, call us today.